The Jumbie Jam Steel Drum is a fantastic percussion instrument that is amazing in quality and sound production. What makes this drum so unique is the melodic sound that is produced due to the steel pan material. Adjustable, easy-to-learn, and fun to practice, this drum can be a great option for individuals of any age and any skill. Before purchasing, I had little experience playing with percussion instruments and found this drum appealing for a variety of reason related to that. 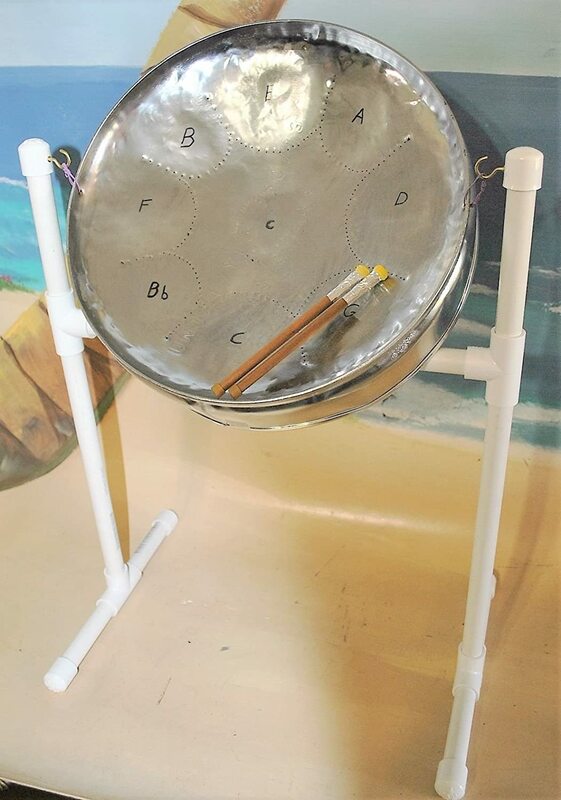 Not only can you learn it quickly with little music reading experience, but the drum is designed in a way that makes it feasible to easily understand how to play each and every note that this steel drum has the capacity to play. 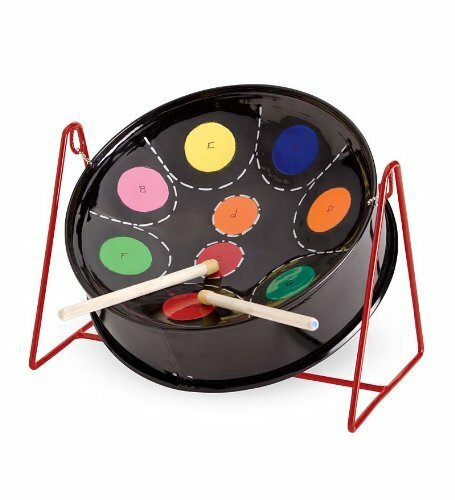 I can’t think of a better-made beginner steel drum that is easy to learn, but also with such a great, pleasurable sound. The drum is also manufactured in a way that allows it to be collapsed, so traveling with the drum is possible. The Jumbie Jam Steel Drum is manufactured by the Panyard Incorporated company, in the USA, as an easy-to-learn beginner styled instrument for enthusiastic drummers and percussionists. The drum’s dimensions are 16 x 16 x 42 inches, leading to its light weight of about 7 pounds. The drum, although coming in its classical metallic finished color, can also be purchased in blue and green, and can be ordered with a foot-shaped base that matches the color of the pan. The purchase of the drum kit comes with the musical pan itself, wooden drumming mallets, a stand that can be adjusted or collapsed in order to arrive at a comfortable height for each and every player, as well as a beginner’s guidebook, songbook, and play along CD, which I thought were extremely impressive additions. With Jumbie jam you get all you need to start learning how to play steel drum. Want to see more Jumbie jam steel drum technical details? Go here to see all the details! The pros of the Jumbie Jam are limitless. The biggest pro, in my opinion, is the simplicity of the instrument. For anyone that hopes to transition into serious steel drum player, this is a perfect way to learn the basics all while making great music and having fun learning a variety of songs. Another pro is the portability. It’s relatively small, light and easy to reassemble. I can carry it with me everywhere and thus practice in diverse settings and environments. This also means that is easy to disassemble and put it under bad or in a closet. The cost of the Jumbie Jam Steel Drum is another huge pro. It is a truly inexpensive option, considering the cost of other options that are similar. One con is the music selection that comes with the purchase. I would like to have a book that has more song options! BONUS: If you want to purchase Jumbie jam steel drum, click here to go to Amazon.com, where they offer free shipping with Jumbie jam purchase! This tabletop Steel Drum has been a perfect addition to my drum collection. I noticed it first as a best-selling item in drum sets but purchased it only after becoming fascinated with the idea of a smoother-sounding drum/percussion instrument. The steel construction along with its sizable characteristics and affordability make it the best option for any beginner drummer or percussion enthusiast. It is also a great option for those beginner musicians that are not formally trained on reading sheet music. With this steel drum option, reading music is not necessary until the player becomes more advanced. 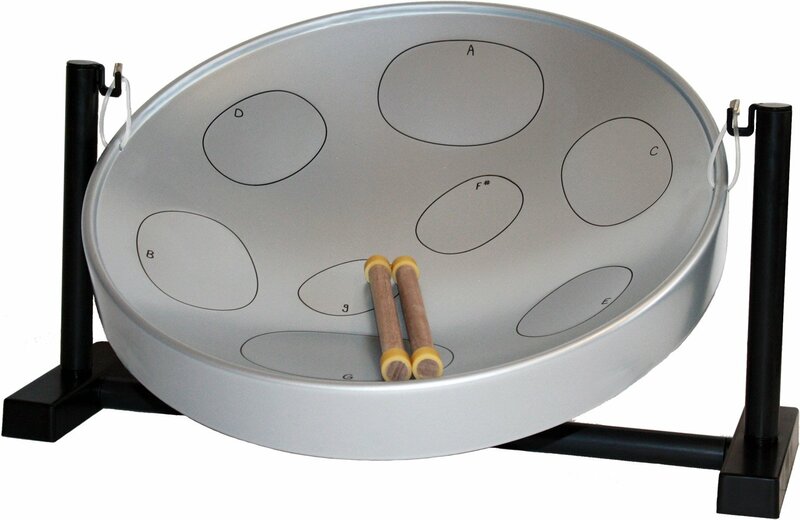 With only 8 notes to learn with the steel drum, any interested, beginner musician can achieve success with the pan drum in little time. A “made in the USA” product, this tabletop instrument was created from high-quality steel, setting it apart from many others of its kind. The Panyard Jamie jam tabletop steel drum itself has measurements of 19.4 x 16.9 x 3.3 inches and weighs approximately 4.9 pounds, making this instrument great for adults and children alike. It was produced by the Panyard Incorporated instrument company and has been labeled as one of the true pride and joy creations of the company due to its fun style and uniqueness. The instrument can be purchased in the untouched basic steel color, in a nice bright blue, or in a brilliant purple/pink hue, which is a great touch for adding to the personalization of the drum. If you are interested in Jambie jam and want to know more technical details about it, you can find it here. With my purchase of the Jumbie Jam Table Top Steel Drum, I received a carrying case that allows me to carry the drum with me and transport it to different meet-ups and musical gatherings with friends. The kit I purchased also came with mallets and a conveniently-sized, user-friendly tabletop stand. One of the most obvious pros about this instrument is its affordability. Costing less than $200 by a long shot, I was able to save lots of money by choosing this option when compared to the amount that I would have spent on different types of drums or drum sets. Another pro is the convenient size of the drum. I can take it with me anywhere, which keeps me engaged with the instrument and motivated to practice with it. Another positive is the ease of which I have been able to learn it as well as the unique sound it produces. Everybody around me loves it! The only Con I can think of (only after fishing for it) is that the music you can play with this Jumbie Jam is limited because of the particular sound and a limited number of musical notes. If you are interested in hearing how Panyard Jambie jam sounds, you can watch the video below. If you like what you read about Jambie jam and would like to buy it, you can find it here. I came across this 14-inch Steel Drum that was made by Steel Drum Source. It caught my eye because it’s homemade, which is not that often with small and affordable drums. It looked like a solid learning steel drum, so I decided to do this short review. What I liked a lot is that it came complete with sticks, stand, music booklet, and even a free instructional DVD. Basically, it has everything you get started. 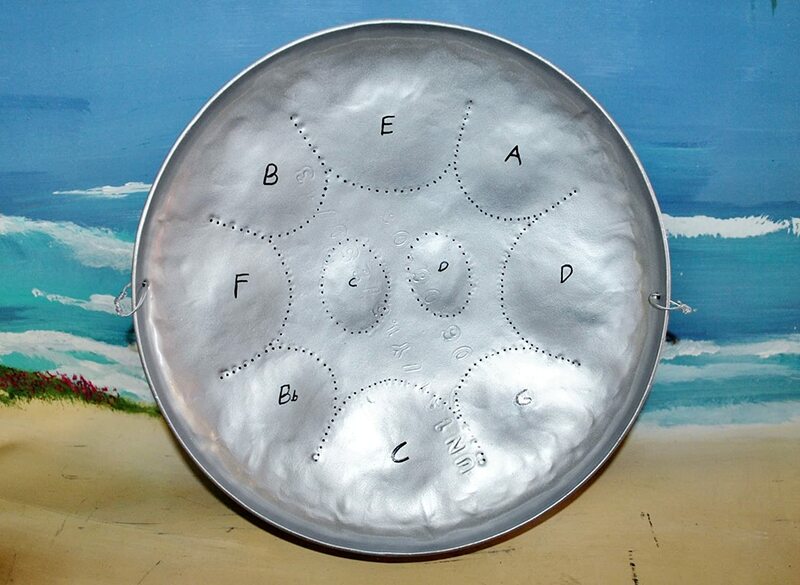 This handmade steel drum is a piece of art or…? The steel drum is handmade and carefully shaped. Which I can appreciate because it gives the pan that authenticity you want. It is a little bit rough on the edges, but I actually like that. The drum was well tuned and sounded good. It’s not professional grade, but good enough for learning and playing for fun. It’s a great starter drum. Drum only has 10 notes, but I like that all notes are marked, so you’ll know where is each note. This will make learning much easier for beginners. It shouldn’t take you long to become good at it especially with the learning kit. Want to see more technical details? Go and get it here! Of course not. Besides a decent handmade steel drum, you also get a steel drum stand, mallets, and everything you need to start learning how to play it. If you are a total beginner or you just want to learn how to play a few new songs, that you gonna love booklet. Some of the songs in the booklet include Jingle Bells, Happy birthday, London Bridge, This Old Man, Twinkle Twinkle little star and few more. Beside booklet, you also get instructional DVD that will help you get started if you never played it before. The great thing about this steel drum is that it’s handmade. Most of this low-end steel drums are not handmade and don’t have that authentic look. If you don’t like the handmade look and are looking for something similar, then check out this Jambie jam review I did some time ago. The price is great. Not the cheapest one I saw for this type and size, but is well worth the price you pay. It’s also lightweight which is great for carrying around. The entire set weighs about 9 pounds which is pretty decent. As I mention before, you get everything you need to start learning to play this wonderful instrument. You can start learning in just a few minutes. This is not a professional steel drum by any standards but does sound ok. It’s good enough for you to learn how to play on steel drum, but not to play professionally. What I didn’t really like is that the stand was made from PVC tubing. It makes stand a little bit unstable. But on the other hand, that makes it lighter to carry around. Mallets were a bit small and not that well made. But given the price, I guess I can’t really complain. But if you don’t like it, you can always buy a different set and it will cost you just a few extra bucks. Overall this is a solid piece of musical instrument and I would rate it 4/5. If you are looking for a steel drum to learn how to play it or play it in your free time than this is a great one to buy. I think you get a lot for what you pay. 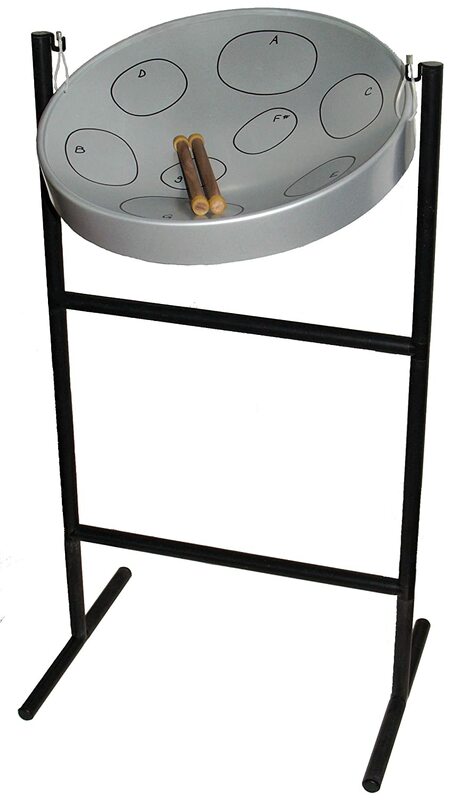 If you would like to know more about this steel drum, you can get it here cheaper than anywhere else.